This exquisite vessel was handcrafted from solid stone using only the finest quality Onyx. The material for each vessel was hand picked by professional stone sculptors and transformed into enchanting works of functional art. The natural properties of Onyx make each vessel a precious one-of-a-kind creation. Due to the variability of Onyx, click here to view our current inventory. During checkout you can note the specific item number in the comments area. We will send you a confirmation with a photograph of your sink before shipping. Please note: These items are sales priced and not available for any additional discounts. Price includes free regular UPS ground shipping to the lower 48 US. 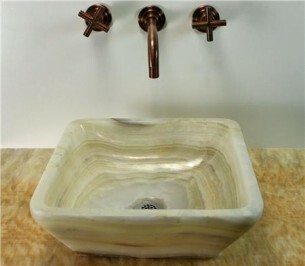 These basins can be made in any of the variations of Onyx shown in the SoLuna collection of Onyx Vessels. Onyx is a semi-precious gemstone of quartz variety with an extremely fine crystal formation. Onyx is prized for its translucence, alternating light and dark striations and interesting color combinations. This wonderful stone is often associated with friendship and celebrated as a harbinger of joy and tranquility. Because of its age and how it was formed, Onyx creates a bond between us and Mother Earth. It gives us a connection to the Ancients.